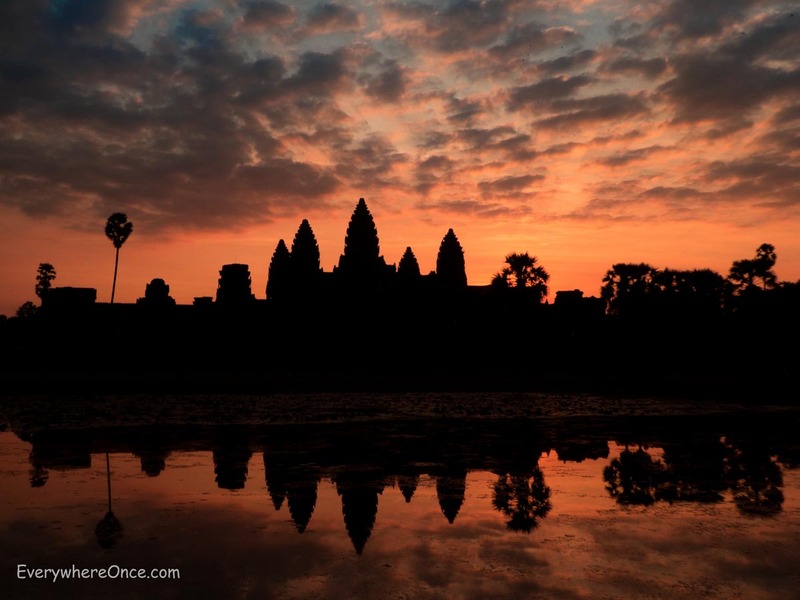 We spent seven days in Siem Reap, Cambodia, and three days exploring the temples of Angkor Wat. Here are some of the things we wish we knew before arriving at the largest religious monument in the world. 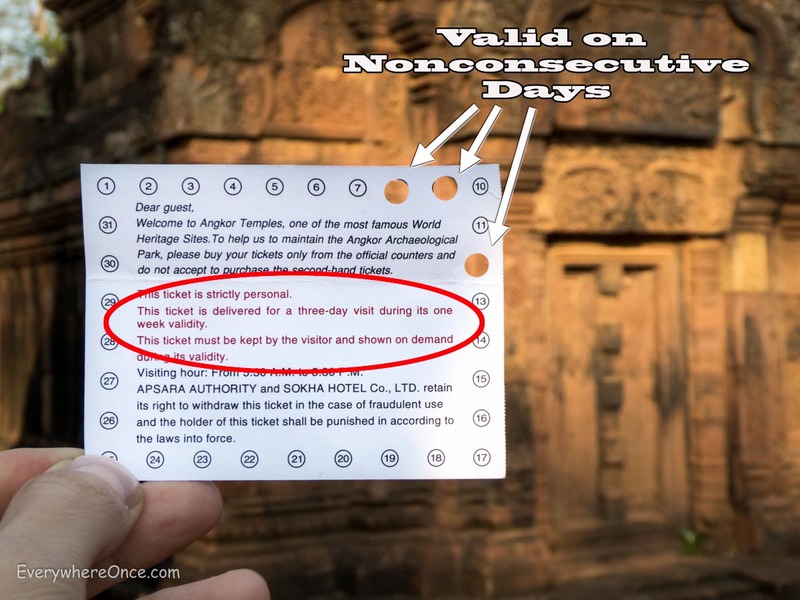 For some unknown reason there’s a great deal of confusion on the internet about how Angkor Wat tickets actually work. Most sites agree that there are three different options for gaining access to the temple compounds. And indeed, we found passes for one, three, and seven day visits available for sale at the gates. What a lot of sites seem to get wrong, though, is whether those multiple day passes need to be used on consecutive days. They don’t. We’re not exactly sure why there’s so much confusion on this issue. Our three-day tickets stated pretty clearly that we could use it on any three days within a given week. Similarly, the seven-day tickets are valid for visits within a given month. Even so, we had read so often that you needed to visit the park on consecutive days that we weren’t sure how the policy would actually be enforced, regardless of what our tickets said. We were half expecting to be turned away when we showed up for the third time in five days, but no; the guard smiled and punched our tickets without issue. And it’s a good thing too. Because as it turned out, we saved the best for last. 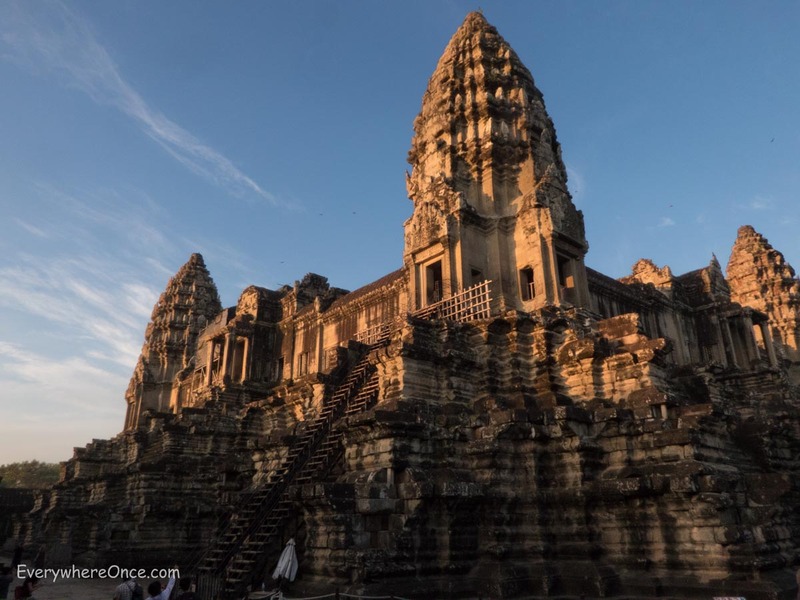 Whenever we’re asked to reveal our best travel tip we always answer with the same two word reply: “slow down.” We always cringe a little when we hear people say things like “you can ‘do’ Rome in three days” or, in this case, Angkor in one. Sure, it may be possible to hit the highlights of Angkor Wat in a single day, but we wouldn’t recommend doing it that way. First of all, the place is huge, a fact that is probably poorly understood by first time visitors. When people think about Angkor Wat they mostly imagine the iconic main temple of the same name (shown in silhouette below). But the Angkor Wat temple is just one of dozens of ruins that dot a 400-square-kilometer area known as the Angkor Wat archeological site. You don’t come to Angkor just to see the one temple. You come here to explore the whole area. And that takes time. How much time? We went back to Angkor on three separate days, and that was perfect pacing for us. Even with three days we only hit the major sites but did so at a leisurely pace. I could see cramming everything we did into two days but would be hard pressed to see how it could be done in one. I can also envision taking a fourth day to spend at the less popular sites. 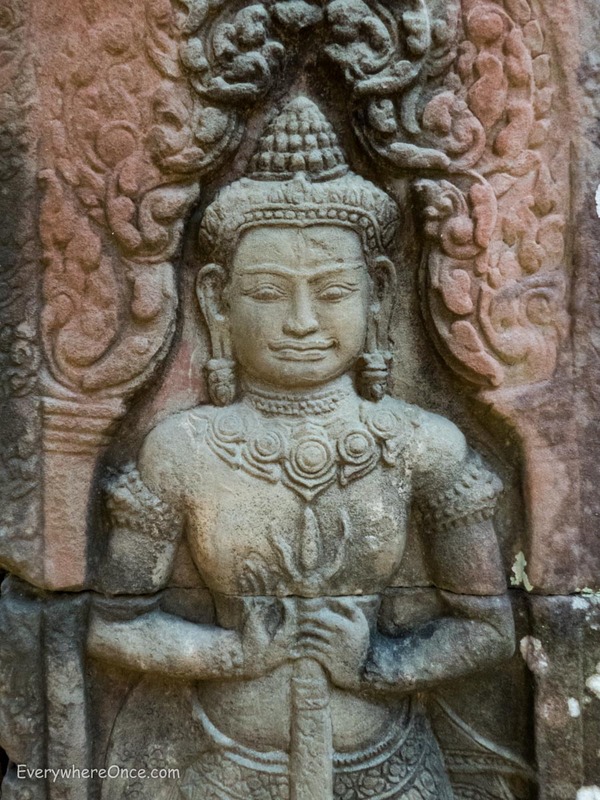 The second thing to consider about visiting Angkor Wat is the heat. We visited in the dead of winter in mid-January and the sun still made us feel like ants under a magnifying glass. Walking the temples in those conditions is tiring. Climbing them is worse. And biking the long miles in between as some people do is something we wouldn’t even consider. Watching the sunrise over Angkor Wat is one of those bucket-list items that graces so many “100 Things to Do Before You Die” lists that it’s hard to visit Cambodia without feeling like it’s an obligation. 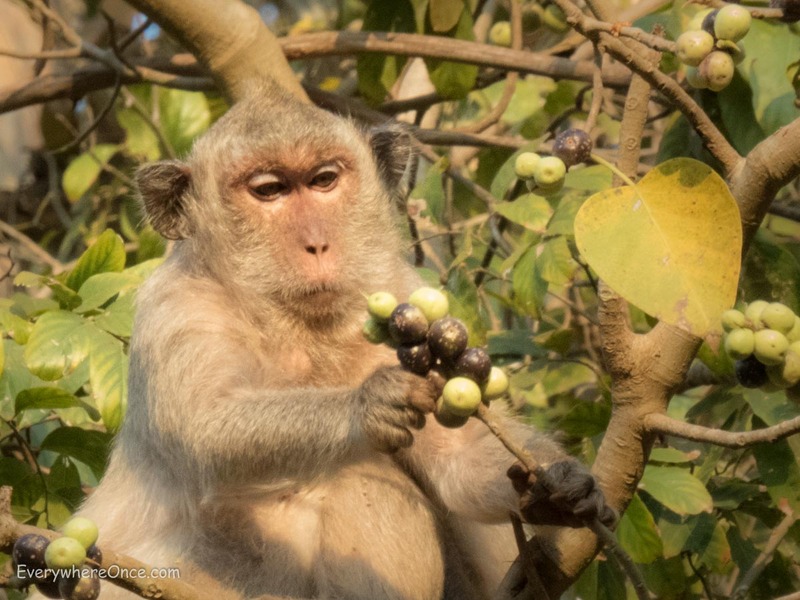 So it’s probably a surprise to no one that we nearly blew it off entirely–and would have if it weren’t for the persuasive young tuk-tuk driver we met the day before and hired to take us to the temples. Somehow he convinced us that getting out of bed at 4 a.m. was a terrific idea. In our experience sunrise and sunset activities are almost always a disappointment, partly because most sunsets are totally lame. And generally speaking, if something needs a spectacular sunrise to make it worth seeing it’s probably not that interesting in its own right. 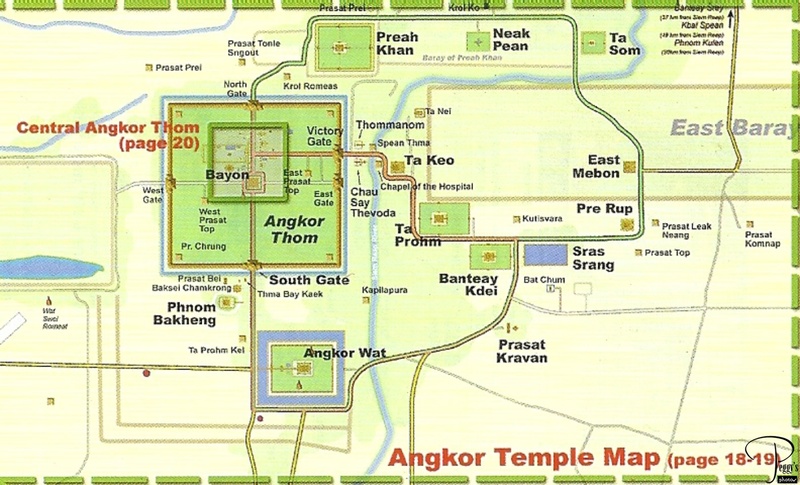 It wouldn’t be too much of a stretch to make that case for the main temple at Angkor Wat. Of all the ruins we visited at Angkor we found the iconic main temple to be the least impressive, at least up close. It lacks many of the elaborate details and nuances that made the other structures in the area so memorable. What Angkor lacks in finesse, though, it makes up for in grandeur. And that grandeur is best seen silhouetted against a brightening morning sky. A fantastic sunrise would obviously make the scene better, but unlike so many other “must see” sunrises, the one at Angkor is less about the sun and more about the site. 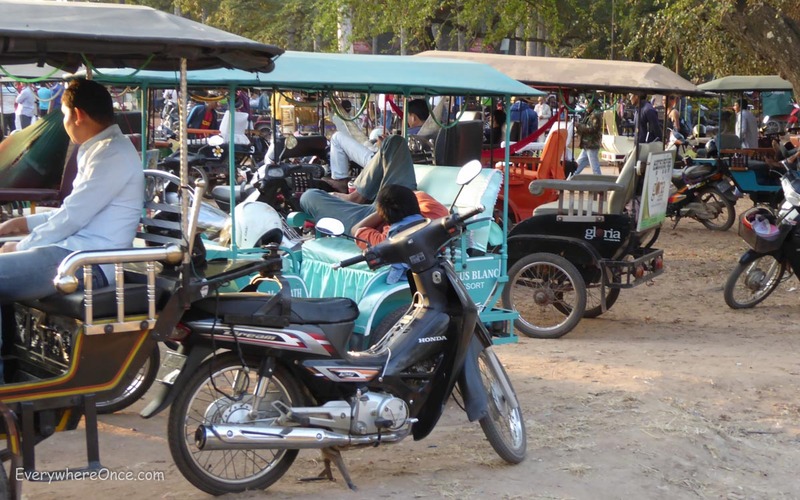 After our first morning watching the sunrise at Angkor Wat we returned to a parking lot crammed with look-alike tuk-tuks. It took us about twenty minutes to find our driver, who was fast asleep. That’s twenty minutes of prime touring time before the heat hit and the crowds descended that we’d have loved to get back to actually spend at the temples. Before you let your ride go, try to get a sense of exactly where he’s planning to wait for you. Also make note of anything distinctive about your vehicle to help you identify your specific needle in the tuk-tuk stack. There’s usually something. If you just show up at Angkor and have a tuk-tuk driver take you to the sites they’ll almost certainly drive you around one of two well-established circuits. There’s a big loop and a small loop. We did both and they’re great. The one thing we’d change about the loops is that they deliver you to the best sites late in the day when they’re already mobbed by other tourists. 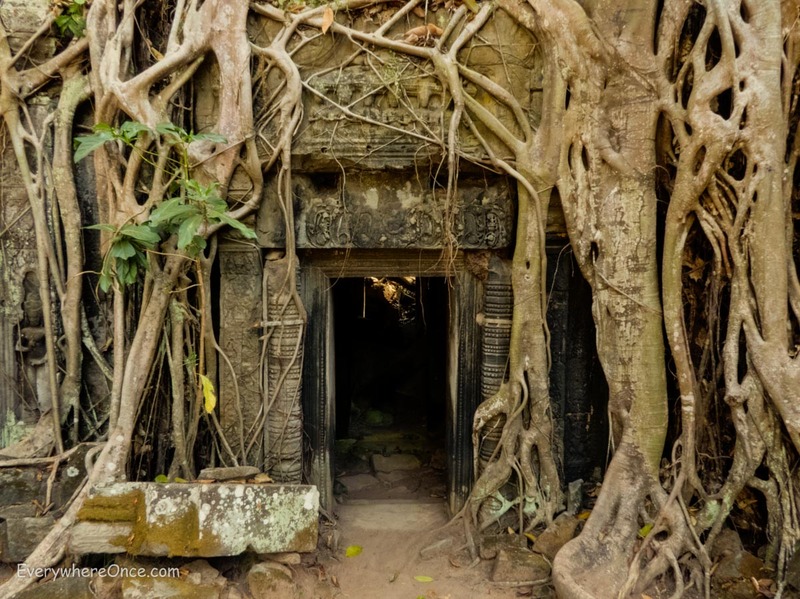 That was especially problematic at Ta Prohm, more commonly known as “The Tomb Raider Temple” owing to its use as a backdrop in that first Angelina Jolie movie. We arrived at Ta Prohm around noon to find it completely overrun with annoying people standing for what seemed like forever in front of the most amazing ancient ruins so they could snap countless photos of themselves with clasped hands and index fingers pointed skywards in what I can only guess were the worst Lara Croft imitations you’ll ever care to see. I wish I could have punched each and every one of them. You know? Lara Croft style. If we had to do it over again, we’d ask our tuk-tuk driver to take us to Ta Prohm (and other popular sites like Bayon and Banteay Srei) first thing in the morning or immediately after watching the sunrise at Angkor. It’d probably take some cajoling because going to those sites first would mean doing some backtracking later on to get to the other temples on the route. 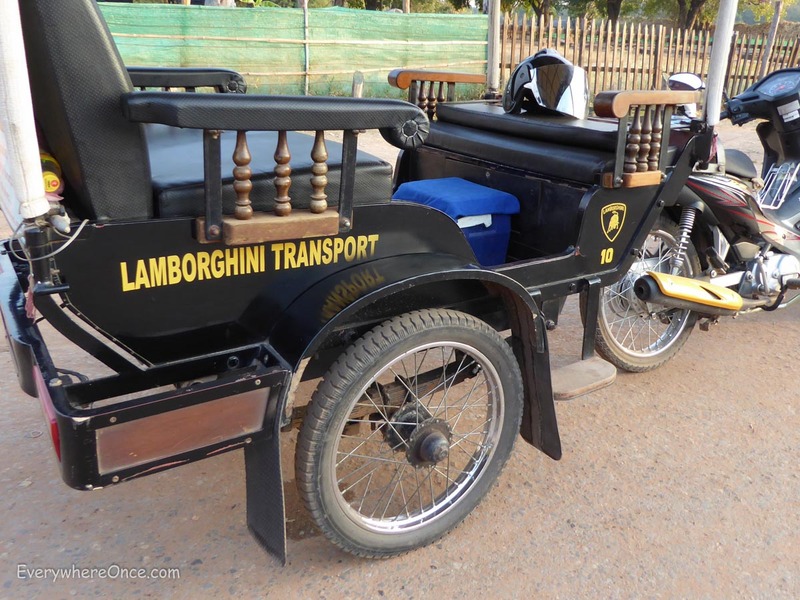 But there’s enough drivers looking to ferry tourists around Angkor Wat that it should be easy enough to find one who’s willing to do the tour you want. One of the best reasons to spend more than a single day at Angkor Wat is because that extra time allows you to take the roughly one hour drive out to one of the most spectacular ruins in the entire complex. It also gives you the opportunity to get there early in the morning while all the other tourists are milling around Angkor after watching the sunrise. Banteay Srei, meaning “Citadel of Women” but more commonly referred to as the Lady Temple, is the most delicately ornate and well preserved temple we visited. It is also the most unique. 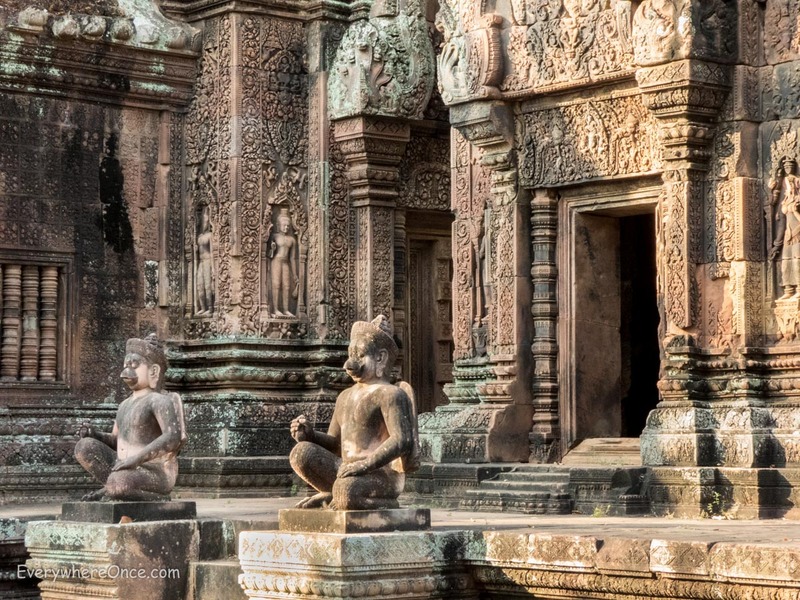 Unlike the other temples Banteay Srei is constructed out of hard sandstone that not only allowed intricate carving but also gave it a distinctive red color. Banteay was by far our favorite temple and one that many visitors miss because of its distance from other popular sites. We made it here on our third day and combined it with a stop at the Landmine Museum and the Banteay Samre temple, both of which you pass en route from Siem Reap. But something amazing happens when you slow down enough to really take in the various sites. 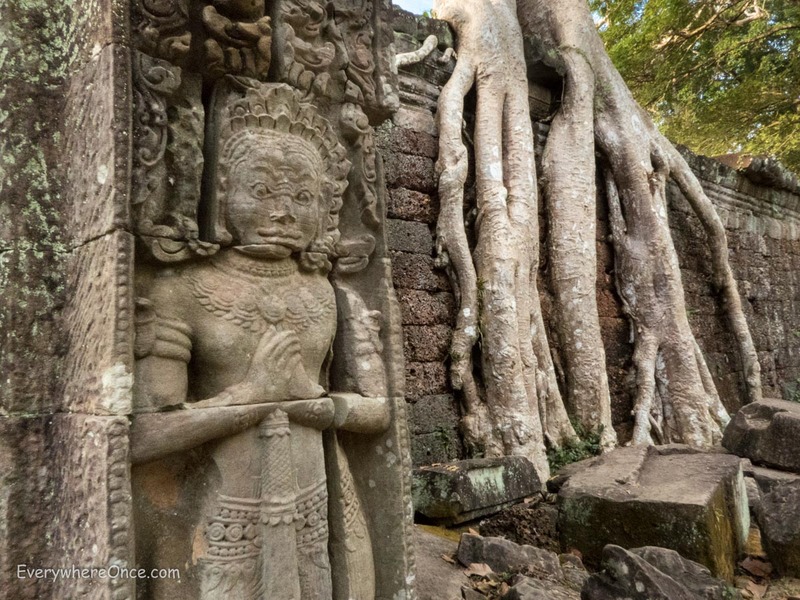 Instead of just seeing the superficial similarities (yup, they’re all Khmer temples) you begin to appreciate the nuances, like the faces carved at Bayon, the trees engulfing Ta Prohm, the remoteness of island temple Neak Pean, the post-apocalyptic alleyways of Preah Kan, the red brick of Pre Rup, and the intricacies of Banteay Srei. I’ll be going there in a few months, and these tips are priceless! Thanks Victoria, we hope our experience is helpful. Thanks Cheryl, Enjoy your trip! Totally agree with all of this. 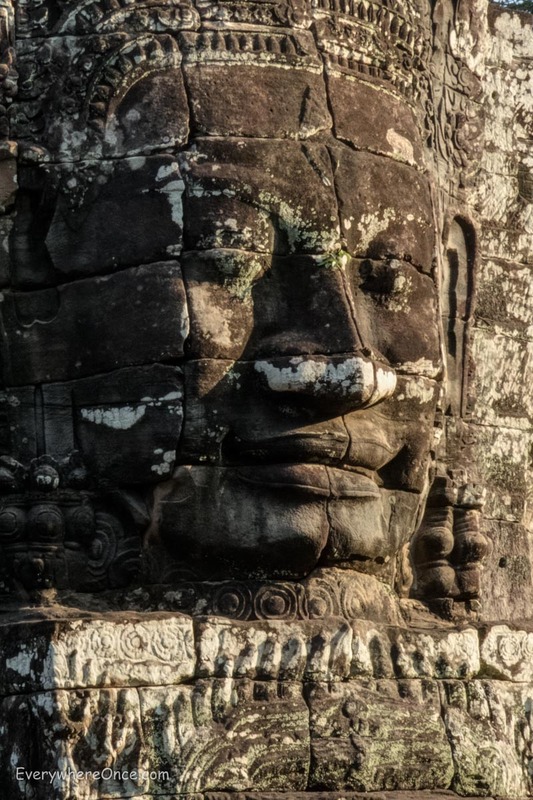 I would just add that reading Dawn Rooney’s guide beforehand can help you decide which temples you want to see, and fill you in on a lot background info.I enjoyed Angkor Wat itself mostly for the wonderful reliefs, but i agree that Banteay Srei – and Bayon – are special. Also – siesta! It helps not to tour in the midday sun. The first time I went I was there for two and a half days and decided that wasn’t enough and went back for a second look. The second time I visited a number of the lesser known temples and enjoyed them, too. I was lucky enough to visit in 2002 and 2004, and can only imagine how bad the crowds are now. Good point. We mention the heat but don’t explicitly say that it might be better to schedule a couple of half-day’s at the temples rather than trying to power through during the worst of the heat. That’s high praise. Thanks so much. I’ve never been here but I’ve read lots about it. I do like your tip on avoiding temple fatigue, I can see how easy it could be done if you are not careful. With regard to your point on consecutive or not consecutive days I’m still not convinced after seeing the picture of your ticket. I buy the ticket on a Saturday but don’t enter the attraction on a Saturday. I first enter the attraction on a Tuesday. From reading that I can’t figure out if I can only then enter Tues-Wed-Thurs or maybe Tues-Thur-Fri (both are within the 7 day validity). Maybe you found out some more information to make it clearer? I can see the confusion people have. Yeah, I agree the wording is non-specific but I don’t really think its very ambiguous. It says you can visit three days in seven and that’s all it says. I wouldn’t assume a bunch of other restrictions that aren’t explicitly stated without good reason. But the best evidence is the little hole punches on the ticket which correspond to the days we visited. Three hole punches in five days. Also, if the park required you to visit on consecutive days there’s no reason to punch the ticket every single time you entered the park. A simple date stamp on the first day would suffice. Of course, when in doubt, ask. I’d encourage everyone to get an update about specific park rules when they buy their ticket. These things do sometimes change. Always wanted to visit there. Thank you for letting me travel vicariously in the meantime! It is seriously our pleasure. Ha, thanks. And we absolutely learned the value of the sun-umbrella while in SEA. Great advice. I did just as you did but 16 years ago. And hey, I shall be in Vienna same time as you – ships that pass in the night. I am only there for two nights. Cool about Vienna. Shame we’re not there longer. We just finagled a 20 hour layover on our way to Santorini. So we’re basically just getting off the plane, touring the Hofburg Palace, grabbing an early dinner, hopefully getting some sleep and then boarding another flight to our intended destination. Forget to mention in my first post that it occurred to me that – since my memory is not what it was, duh – it might be a good idea to take a photo of your tuk-tuk if it is going to wind up in the middle of a bunch of others. That only happened once when I was there, but the crowds look to be very much worse now. Excellent and informative post, Brian and Shannon. 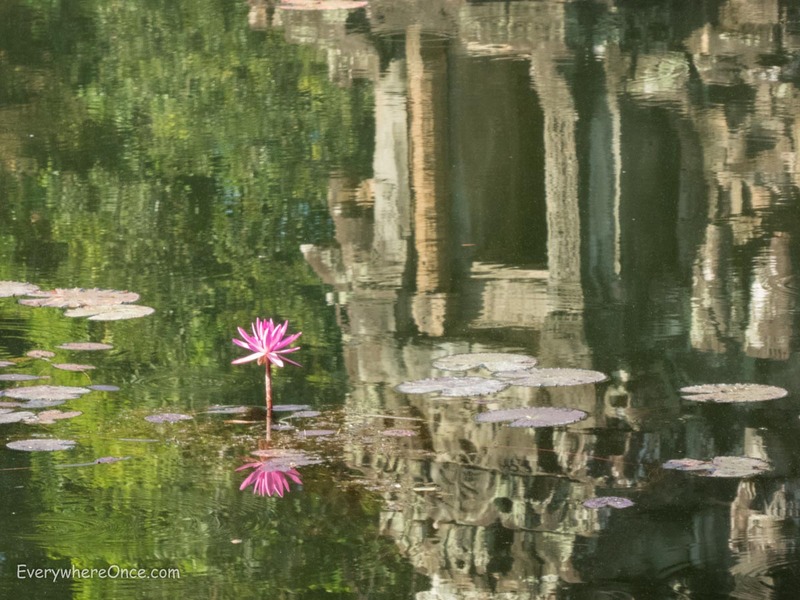 Visiting Siem Reap was a thrill for me and your images tell a beautiful story. Fantastic advice- I wholeheartedly agree. Banteay Srei and Bayon were my faves. I was there in May, right at the hottest part of the year. I feel like a lunch break during the hottest part of the day is essential, and will help prevent burnout! The information about the validity of the entrance ticket you give is definitely correct at this moment. The confusion comes from the fact that a few years ago it was not possible to do three separate days in a week, but it had to be three consecutive days. That has changed. We did the visits on bicycles (being Dutch), and really loved it because it gives you a really good feel for the beauty and atmosphere not only of the temples but of the whole area. Just be prepared to take it slow and spend time on visiting the place. That’s not so difficult though, when there’s so much to see! Contrary to what you say, we did Ta Prohm just after noon, when most tourists were having lunch and the place was relatively quiet, and had a rest afterwards. 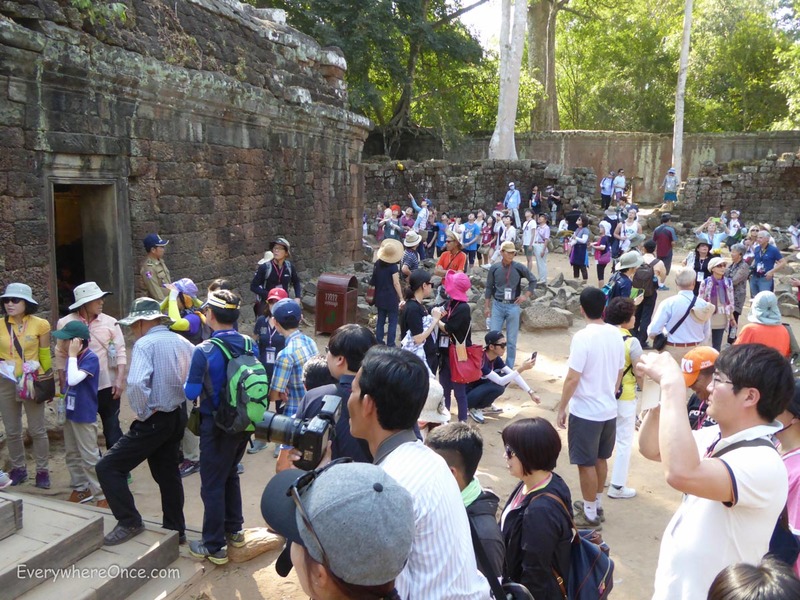 One more tip: avoid Bayon around nine o’clock, when the Chinese tour-buses arrive and you can’t move around at all. Either do it before or later on the day, when all the buses have already left. We are here now. Thank you so much for your tips. We went to the Minefield Museum today and realized that the butterfly sanctuary and Bantey Srey are super close. Oh well. We`ll be buying a 3 day pass tomorrow after reading your post. Thanks! Well, this is a pretty great explanation of the site. I have been planning on visiting Angkor Wat for a while now, and the decision is definitely made now. Great tips. Cheers.